What color are you today? Our souls know so many colors and emotions. Most of us experience several different, sometimes conflicting, emotions at once. It is this unique mix of transient emotions that defines my overall mood at any particular moment. 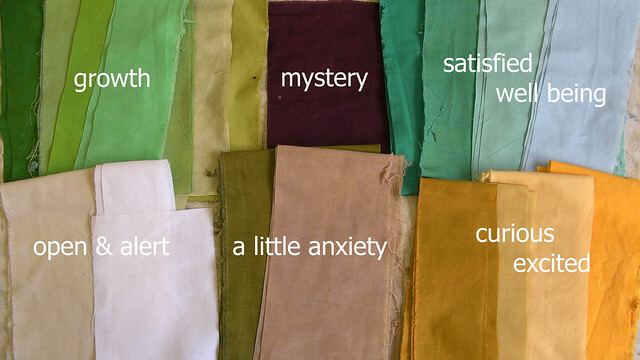 Probably the most challenging part of making a Modern Mood Quilt will be identifying your emotions at the beginning of each session and choosing the corresponding colors. Refer to the fabric mood chart you created in step 1 as a guide. My mood on June 9, 2010 ~ Facts: beginning a new project, have the whole day to work in the studio, beautiful hand-dyed fabrics, positive feedback on blog. A. Get CENTERED! Be still and tune into what you are feeling at the moment. Once centered, I can sometimes physically sense my emotional state through my body. When I'm angry my hands and arms heat up, when I'm sad I feel heavy, when I'm afraid the pit of my stomach churns. Our bodies hold different physical cues to our emotions. If you are familiar with some of your physical cues then you might be able to identify what you are feeling by listening to your body. B. If I can't discover what I'm feeling through physical cues then I ask the following questions to help identify my feelings. What are the facts of my situation at the present moment? What am I feeling based on those facts? Try to make a distinction between the actual facts of your situation and your thoughts about the situation. Facts, and thoughts about facts, are two different things that often result in two different sets of feelings. I try my best to focus my feelings as much as I can on the facts, and not my thoughts about the facts. My mood on June 22, 2010 ~ Facts: vacation canceled, recent fight with boyfriend. C. Once you write down your feelings, pick colors based on the mood color chart you created in Step 1. It's OK to refine your chart, since you will probably discover new or shifting relationships between your emotions and color as you work through this process. Nothing is set in stone. D. You can also work in reverse order. Choose the colors you are intuitively drawn to that day. Quietly check inside to see how they correspond to the facts and emotions of your present situation and see what you discover about your prevalent mood. Do a little journaling. 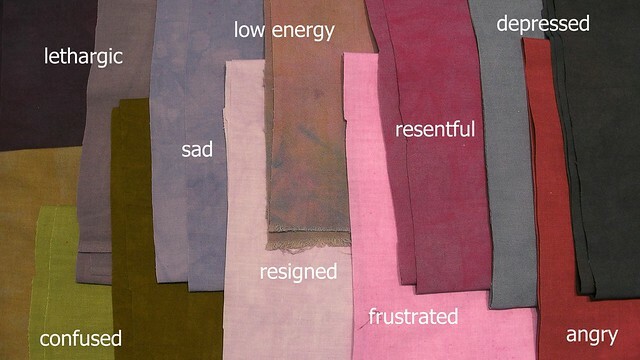 E. Once you have identified emotions and colors, pre-cut amounts based on how the different emotions rank in your current mood mix. I usually cut proportions from selvage to selvage but you don't have to follow that rule. If you are really happy then cut a large swatch of your happy color. If at the same time you are also a little bit tired cut a small swatch of your tired color. You are cutting an amount of material to be used for one section of your quilt not for the entire quilt. This is an improvised process so there is no set size for the section you will ultimately make. It's the other way around. The amounts you intuitively choose will define the size of your section. F. Finally, while staying true to working with your emotions, keep certain color design principles in mind. Always include Consider using neutrals in your mix of colors because they can make your colors pop! Check and see if your colors include a range of light to dark values. Make a black and white copy of your set of colors to see how they rank in value (gray scale). If you are working with prints consider mixing in some solids because they can give the eye a place to rest. In Step 3 we will choose a pattern/theme as the starting point for our improvised mod-mood quilt sections. What is your process for determining your emotional mix or mood at any given moment? Can color help you do this? What have you discovered about your mix of emotions? Any surprises? Satisfactions? Dissatisfaction?